One of the main reasons why people never reach their fitness goals is because they give up too easily and stop following their diet or exercise programs. It is very easy to lose motivation and quickly return back to old lifestyle habits. Here are a few tips to keep you going until you get into the best shape of your life. Before you give up and decide that your program is not worth following, think about the results you would achieve if you followed through to the end. Imagine losing weight, having a six pack or being in the best shape of your life. In fitness if you want to achieve a goal, you have to get up and earn it. It might be challenging to follow a healthy diet and you might not be in the mood to train, but doing so for an extended period of time will help you achieve a goal that will be worth every second of hard work. Sometimes it all boils down to doing it, whether you feel like it or not. Your body doesn’t care if you are motivated. The results will always be the same, regardless of what state of mind you are in. There is a saying that 80% of success is showing up. We all have days when we want to eat bad food or skip a workout. Don’t give in and do what you need to do to reach your goals. This guarantees success and will ensure you never fall off the wagon. If we only train or follow a good diet when we are in a good mood, then we will never see any results. Success is all about doing what needs to be done whether you feel like it or not. You will discover that a healthy diet and exercise will help to improve you mood and make you even more productive. 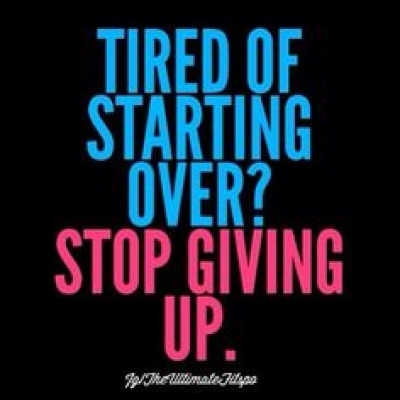 Many people give up too easily because it takes so long to see results. A major body transformation takes no less than two to three months. Fat loss is extremely slow and gradual. It can be frustrating to put in so much work and barely notice any results, however, if you are consistent and keep working hard, you will eventually start to notice differences in your body. Stay patient and focus on the journey rather than the destination. As that quote says, Rome was not built in a day. It might be extremely difficult to follow through with a diet or exercise program, however all things are difficult before they become easy. The first month will be extremely tough and might leave you feeling hungry, tired, exhausted or even frustrated. However, do not give up and stick it out. It will get easier with time. In conclusion, it is important to follow your program even when you feel like your motivation is starting to fade away. Nothing worth having comes easy and with a lot of hard work and consistency, you will see the results you are looking for. Have the strength to do what needs to be done whether your motivation is at its peak or slowly creeping away.